In his book In Praise of Shadows, novelist Junʼichirō Tanizaki recaptures what is otherwise lost under the glare of modernity. As indicated in the title, he favours the half light, shadows and darkness of recesses, verandahs and outhouses, and with them the patina and ambiguity of materials worn over by time: old wood, stone, moss, etc. As children of the Enlightenment, it is inevitable that metaphors of light, with their entailments of certainty, confidence and clarity, dominate our engagement with reason, truth and logic. Mathematician and architect Lionel March’s seminal essay, “The logic of design and the question of value,” cautions against confidence in systematised design methods. He illustrates this uncertainty with C.S. 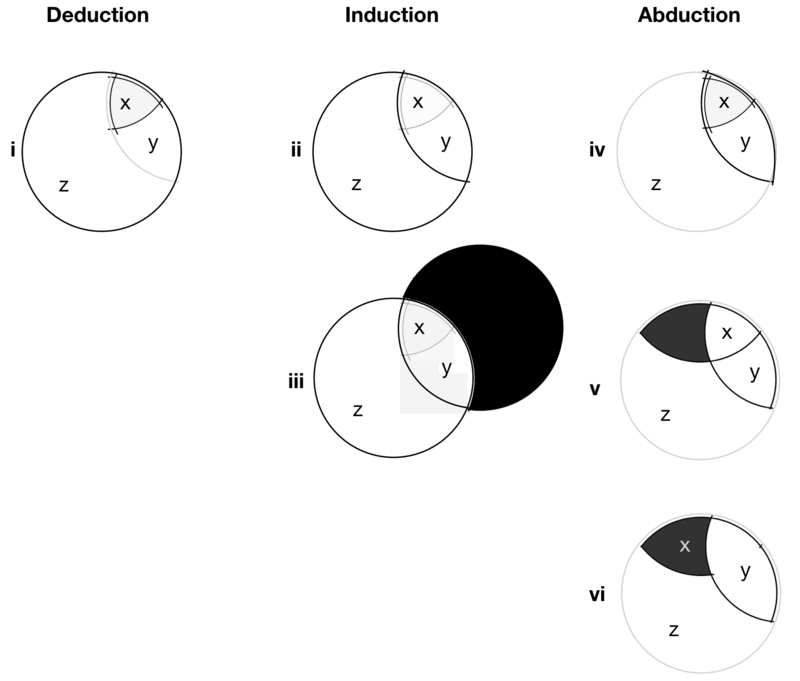 Peirce’s three modes of inference: deduction, induction and abduction. (See previous post.) March positions design in the uncertain but productive mode of abductive inference — inventing the cases about which deductions can be made. I was struck by March’s use, in passing, of the term “shadow of doubt.” These are the black remnants in March’s inference diagrams, redrawn here (17). The top row of fragments of 3 intersecting circles (i, ii, iv) shows the condition we would like to assert with confidence, if only we could. The cases iii, v and vi indicate the degree to which the support for the condition in the top row is lacking — the shadows of doubt. Here is March’s caption to the diagram (his figure 5 on page 17). 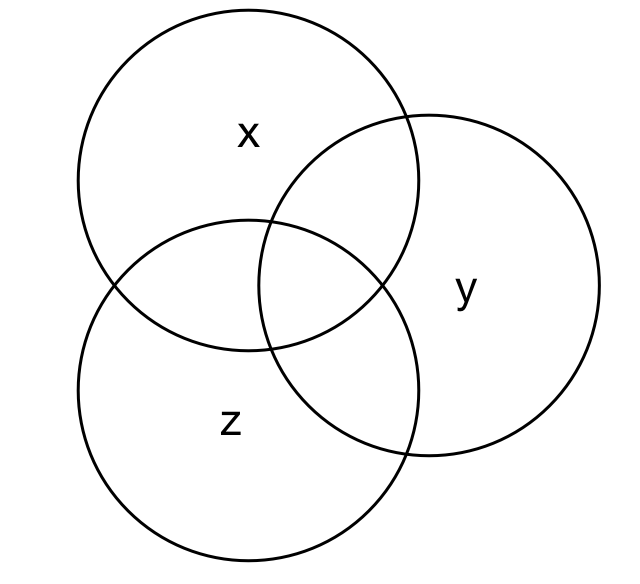 I’ve adjusted the labels to the six circular diagrams (i-vi), and changed his use of “x ≤ y” etc to “x is in y” (all in square brackets ). I introduced the bold type not in the original. Example vi indicates: knowing that Edinburgh (y) is in Scotland (z), and that x is somewhere else (not Edinburgh) in Scotland (e.g. Aberdeen) negates the possibility that x is in Edinburgh. It may also help to recognise that the diagrams are derived from three intersecting circles containing all possible common areas. March, Lionel. 1976. Introduction: The logic of design and the question of value. In Lionel March (ed. ), The Architecture of Form: 1-40. London: Cambridge University Press. Tanizaki, J., In Praise of Shadows, trans. T.J. Harper and E.G. Seidensticker, Stony Creek, CT: Leete’s Island Books, 1977. For further (lattice) representation and discussion of Peirce’s modes of inference see Awbrey, Jon. 2017. Functional Logic : Inquiry and Analogy. InterSciWiki, 21 May. Available online: http://intersci.ss.uci.edu/wiki/index.php/Functional_Logic_:_Inquiry_and_Analogy (accessed 4 February 2018). Thanks to Jonny Cache for the link. Thanks for the link. I’ve approved your and other people’s comments now!